The Muslim armies managed to defeat the Sasanian troops in several decisive battles in the middle of the seventh century AD and establish the rule of the young Islamic Empire in the former Sasanian territories, and large parts of the Byzantine Empire, by the beginning of the eighth century. The Battle of Qadissiya in November of 636 saw the defea= t of the Sasaniantroops under the command of Rustamson of Farrokhzad, while by 638 the Muslims had raided Ctesiphon, the capital of the Sasanians in Mesopotamia (Sasanian Asorestan). The Battle of Nahavand in 641 saw the destruction of a Sasanian alliance, and in 651, the last Sasanian Emperor,Yazdgerd III, was killed while fleeing to China. At this time, the Muslims under Caliph Umar I were led by the political power based in Medina. Early Islamic administration largely left the local rulers and governors in their place, only asking for allegiance and a minimal tribute. As a result, the local coinage largely continued based on the previous administrative practices, particularly as long as Yazdgerd III himself was alive. Even after his death, we have evidence of the issuance of YazdgerdIII coins in Sistan, in the eastern most parts of Iran, probably by his son and pretender to the throne, Prince Peroz. The situation continued the same way, even under the rule of Caliphs Uthman, and Ali, the latter of whom even moving his capital to Kufa, near Hira, in the former Sasanian territories, in 656. Arab governors would basically copy the style of the Sasanian coins, including the portrait of the king (often Khosrow II Aparviz) modifying them either by including the Arabic formula Bismillah (“in the name of God”) on the margins, or by writing their names (in either Arabic or Pahlavi scripts) in place of the name of the king. These series, often called Arab-Sasanian coinage, continued well into the late seventh century and is known from many localities, including Fars, Khorasan, Khuzistan, and even Mesopotamia. With the establishment of the Umayyad Caliphate following the death of Ali (661 AD), the capital of the Caliphate was moved to Baghdad, while the coinage continued to follow local patterns, with Arab-Sasanian coins prevailing as the currency of the former Sasanian territories, and Arab-Byzantine coins gaining prominence in the former Byzantine lands. <s= pan=”” class=”3DSpellE”>Muawiyya, the first Umayyad Caliph, was followed by his son Yazid I and grandson Muawiyya II, whose rule further established the Umayyad power and included the earliest establishment of the Islamic imperial administration. This, however, was faced with a great dilemma, the management of the taxation and the divan system established under the earlier caliphs (and indeed the prophet himself). In 685, Abdul Malik I, of theMarwanid branch of the Umayyads, was elected as the Caliph. Seeing the extreme disarray in the economic and financial establishment of his empire, Abdul Malik constituted a series of reforms which saw the establishment of a new monetary system. In effect, Abdul Malik created a bimetal currency standard, with gold coins following an old Roman weight and being called Dinar (from Latin denarius), while the silver weight standard was copied from the Sasanians, with the name Dirham (Sasanian derham, from Gk. Drachme). The monetary reforms of Abdul Malek thus established the coinage of the Islamic world up to the modern times. 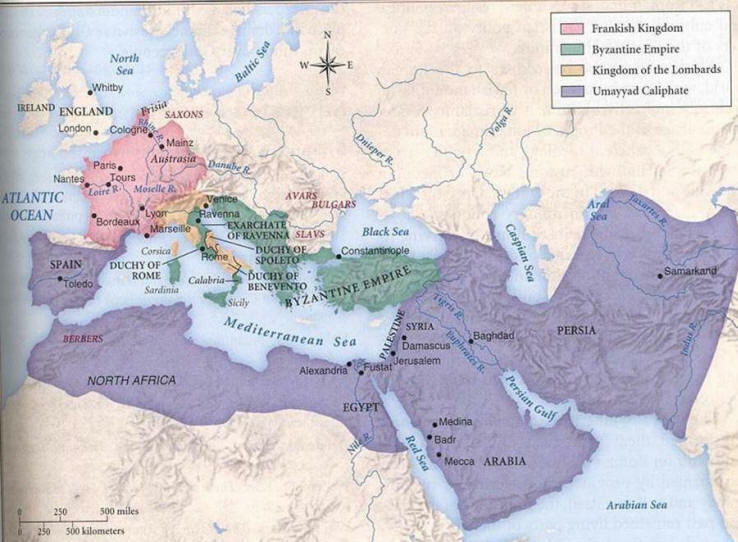 The Umayyad Caliphate continued to rule the Muslim world as a unified empire until the middle of the eighth century. Owing to the growing discontent because of the financial and administrative oppression and mismanagement of the Umayyad governors, a series of rebellions under the leadership of an Iranian commander named Abu Muslim was initiated from Khorasan, in the eastern Iranian lands. Gathering under the black banner of the Abbasids, relatives of the prophet and claimants to spiritual, as well as earthly, authority, this movement, known as the Abbasid Revolution, eventually managed to dislodge the Umayyads from their position of power. Abdullah Al Saffah, the first Abbasid Caliph, had to establish his power against the threats from the remaining Umayyad enclaves in Syria and North Africa, as well as the Chinese Tang Empire who were encroaching on Central Asia. His itinerant rule was nominally centered in Kufa, in Mesopotamia, thus taking the capital of the Islamic Empire back to the Sasanian territories, after almost 100 years of rule from Damascus. Al-Saffah’s short rule ended in 754 when he died in Iraq and was replaced by his brother, the energetic Caliph Al-Mansur. Ruling until 775, Abu Jafar al-Mansur al-Dawaniqi ushered in the Golden Age of Abbasid rule and Islam, founding the great city of Baghdad, named Dar ul-Salam (“House of Peace”), in 762, establishing it as the capital of the Abbasid Caliphate, and the world of Islam, for the next 500 years. Al-Mansur was followed by his son al-Mahdi and his grandson al-Hadi, the latter being succeeded by his brotherHarun al-Rashid (786= -809) the greatest of Abbasid Caliphs. Under the rule of Harun, the Abbasid power spanned from Central Asia/Transoxiana to Morocco and southern Europe. Great palaces and gardens were built in Baghdad, and the economy of the Islamic world flourished from the growth in trade and the inflow of gold through the Sahara route. Harun patronized many scholars, poets, and artists, and under his rule, arts and culture of Islam first emerged from the shadow of its Sasanian and Byzantine influences, although the court of Harun al-Rashid resembled that of the Sasanians more than anything else. Indeed, the Persian speaking administration of the Abbasid Caliphate was most powerful during this period, exemplified by the dominance of the Barmakid family (former caretakers of the Buddhist temple of Nawbihar in Balkh). Harun’s famous embassy to Charlemagne, which included many gifts among them a white elephant, more than anything else established his reputation as the most powerful ruler of the Mediterranean as far as northern Europe. Harun al-Rashid’s idyllic reign was followed by the struggle among his two sons, Amin and Ma’mun. Soon expanding to their military support among the Arab and Perso-Turkic factions (respectively) in the court, this struggle threatened to end the= Abbasid power altogether. Abdullah al-Mam’mun finally came out as the winner in 813 and ruled until 833, continuing and expanding the cultural renaissance of the period of his father. It was under al-Ma’mun’s rule that the first centers of translation= and learning were established in Baghdad, where great works of Indian, Persian, Greek, and Syriac learning were translated into Arabic, allowing for the flourishing of Muslim learning itself. Baghdad was by this time truly transformed into a cosmopolitan city, where adherents of all faiths gathered, disputed about the merits of their belief, and contributed to a common pool of learning and progress. The economy also continued to develop, now directing the route of most trade from south, central and east Asia through Baghdad and Basra, the largest cities in Mesopotamia. The rule of al-Mu’tassim and al-Mutawakkil, the brother and nephew of al-Ma’mun, were the last periods of this great period of flourishing in the Abbasid caliphate. The political discontent that had started from the struggle of al-Amin and al-Ma’umun had escalated to a full-fledged power grab by the Turkic, Persian, and Arab commanders at the court. The highly militarized, and factional, caliphal court allowed for the rise of autonomous movements all around the Caliphate. In Egypt and Syria, a dynasty of Central Asian commanders declared virtual independence, while even Mosul, a short distance to the north of Baghdad, was coming under the rule of local dynasties and warlords. The eastern territories, the scions of Abbasid support but also increasingly autonomous regions due to their powerful military structure, also started their own struggles for autonomy and independence. It was out of these struggles that local dynasties such as the Tahirids or the Saffarids managed to carve their own spheres of influence, and eventually independence. Cooperson, Michael. Classical Arabic Biography: The Heirs of the Prophet= s in the Age of al-Ma’mun. Cambridge University Press, 2000. Daniel, Elton L. The political and social history of Khurasan under Abbasid rule, 747-820. Bibliotheca Islamica, 1979. Donner, Fred M. The Early Islamic Conquests. Princeton: Princeton University Press, 1981. Hawting, Gerald R. The First Dynasty of Islam: The Umayyard Caliphate AD 661-750. Routledge, 2000. Kennedy, Hugh. “Central Government and Provincial Elites in the Early ‘Abbasid Caliphate.” Bulletin of the School of Oriental and African Studies 44 (1981): 26-38. Kennedy, Hugh N. The Prophet and the age of the Caliphates: the Islamic Near East from the sixth to the eleventh century. Longman Publishing Group, 2004. Lapidus, Ira. A history of Islamic societies. Vol. 2. Cambridge: Cambridge University Press, 1988. Pourshariati, Parvaneh. Decline and fall of the Sasanian empire: the Sasanian-Parthian confederacy and the Arab conquest= of Iran. London: IB Tauris, 2008. Robinson, Chase F. “The conquest ofKhuzistān: a historiographical reassessment.” Bulletin of the School of Oriental and African Studies, University of London (2004): 14-39. Sourdel, Dominique. “The Abbasid Caliphate.” The Cambridge History of Islam 1 (1970): 104-39.